The Harper Connelly omnibus! Honestly, after finishing The Unseeing by Anna Mazzola, I needed something contemporary/ paranormal and something I reliably knew that I would enjoy. I haven't read one of the books in this omnibus since April but I could jump back in no problem. That's just the kind of writer that Charlaine Harris is. I love her. I'm on the third of the four books; An Ice Cold Grave and I think it's my favourite so far. 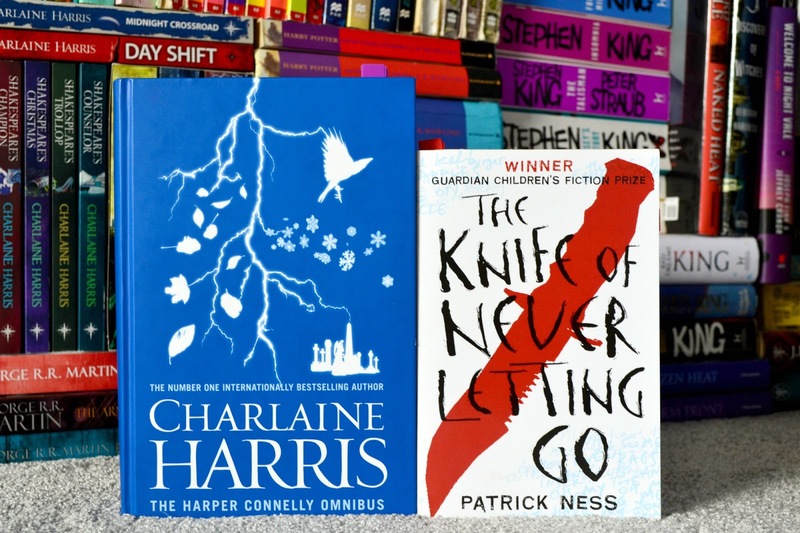 And The Knife of Never Letting Go by Patrick Ness. Yes, the first book in the Chaos Walking trilogy that was in my 'Eventually' TBR. Apparently, eventually was three months later. I'm not totally sold on it so far though, I'm like 150 pages in and even though it is really easy to read (it's Middle Grade after all), I just feel like barely anything has happened even with the whole- men can hear thoughts, women are dead thing. Has anyone else read this? Is it worth persevering? So that's what I'm currently reading! What about you?